Donna Karan is always mining the city itself for inspiration, and this season was all about art. Cold-dyed canvas, papery cottons and painted prints covered in appliqué rendered looks as works. 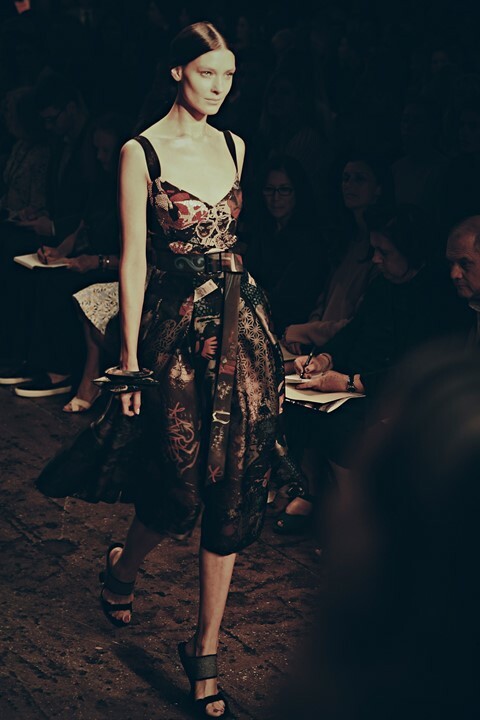 Raw expressiveness linked the materials in the collection, and some pieces even appeared to be tapered and cinched with shiny black tape, as if quickly altered by someone who was eager to see a silhouette come to life. Tall – very tall – woven hats seemed to float atop models' heads: Stephen Jones' accessories elevated the collection, adding a sculptural element to the arty inspiration. Of course, even in a Mad Hatter chapeau, Karlie Kloss managed to close the show with her signature serpentine allure. The art inspiration brought to mind David Byrne's recent plea in The Guardian to take action against the rampant inequality in New York, which he said stifles creativity and cultural vibrancy.